July is Smart Irrigation Month. In honor of this effort, we want to offer easy tips to conserve water with irrigation and more. Read about Smart Irrigation Month at http://www.smartirrigationmonth.org/. The United States uses the equivalent of 360 billion kilowatt hours per year–9% of the nation’s total electricity use–to pump, heat and treat water. This is 33% more than is generated by all of the nation’s hydroelectric dams in an average year and equal to the output of over 100 typical coal fired power plants! Following are some tips to help reduce the amount of water waste around your home. 1. More plants die from over-watering than from under-watering. Only water plants when it is necessary. 2. Use sprinklers that throw big drops of water close to the ground. Smaller drops of water and mist can drift onto non-target areas, or evaporate before they hit the ground. 3. Water lawns during the early morning when temperatures and wind speed are the lowest. This reduces evaporation and waste. Watering in the evening can result in leaves staying wet all night, promoting disease problems. 4. Hand-water with a hose where possible. Homeowners who water with a handheld hose can use one-third less water outdoors than those who use automatic sprinklers. 5. Use mulch to retain moisture in the soil. Mulch also helps reduce soil compaction from raindrops, and helps control weeds that compete with landscape plants for water. 6. Purchase a rain barrel and install it below your gutter downspout. You can capture a little more than half a gallon of water for every square foot of roof during a one-inch rainfall-that means a 90 square foot roof would completely fill a 55 gallon barrel! You can use that bounty to water your garden. 7. Plant smart. Xeriscape landscaping is a great way to design, install and maintain both your plants and irrigation system. With this method, you plant native and/or drought-tolerant grasses, ground covers, shrubs and trees. Once established, they do not need water as frequently and usually will survive a dry period without watering. It will save time, money and water. 8. Position sprinklers so they’re not watering driveways and walkways. 9. Adjust your lawnmower to cut grass to a height of 3 inches or more. Taller grass encourages deeper roots and shades the soil to reduce moisture loss. 10. Start a compost pile or scrape food into the trash instead of running your garbage disposal, which requires a lot of water to work properly. Use the compost to improve the quality and water holding capacity of your soil. 11. Use a timer on hose-end sprinklers to avoid over-watering. 12. When the kids want to cool off, use the sprinkler in an area where your lawn needs it the most. 13. Only water your lawn when needed. You can tell this by simply walking across your lawn. If you leave footprints, it’s time to water. 14. While fertilizers promote plant growth, they also increase water consumption. Apply the minimum amount of fertilizer needed. 15. Aerate your lawn. Punch holes in your lawn about six inches apart so water will reach the roots rather than run off the surface. 16. Never put water down the drain when there may be another use for it such as cleaning or watering a plant or garden. For example, collect the water your use for rinsing fruits and vegetables, then reuse it to water houseplants: or when cleaning out fish tanks, use the nutrient-rich water to water your plants. 17. Install sprinklers that are the most water-efficient for each use. Micro, drip irrigation and soaker hoses are examples of water-efficient methods of irrigation. 18. Outfit your hose with a shut-off nozzle that can be adjusted so water flows only as needed. When finished, turn the water off at the faucet instead of at the nozzle to avoid leaks. 19. Use hose washers on water hoses and attachments to eliminate leaks. 20. Do not leave sprinklers or hoses unattended. Your garden hose can pour out 600 gallons of water or more in only a few hours, so don’t leave the sprinkler running all day. Use a kitchen timer to remind yourself to turn it off. 21. Verify that your home is leak free. Homes can have hidden water leaks that may be noticeable indoors, but outside can go undetected. Read your water meter before and after a two-hour period when no water is being used. If the meter does not read exactly the same, there is a leak. 22. Avoid purchasing recreational water toys that require a constant stream of water. 23. Go with splashes of color instead of mass plantings of annuals. Yes, they’re beautiful, but annuals (such as petunias and impatiens) typically require more water than most perennials. 24. Rethink your lawn layout. If you live in a dry climate, you’ll need a lot of sprinkler activity to maintain a huge grassy swath. Consider replacing it with decorative gravel, which also reduces runoff. 26. Use water from dehumidifiers to water indoor and outdoor plants. You can also collect condensation water from air conditioning units to use for watering plants. 28. Plant in the fall when conditions are cooler and rainfall is more plentiful. 29. 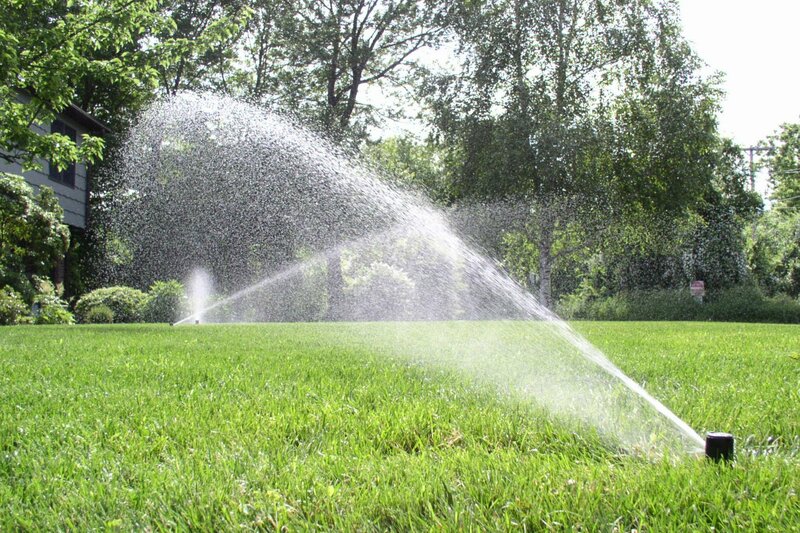 If water runs off your lawn easily, split your watering time into shorter periods to allow for better absorption. A heavy layer of thatch can be hydrophobic, so de-thatching might help. 30. Remember to check your sprinkler system valves periodically for leaks and keep the sprinkler heads in good shape. In addition, check your timing devices regularly to be sure they operate properly. 31. Water your plants deeply, but less frequently to encourage deep root growth and drought tolerance. 32. Learn how to shut off your automatic watering system in case it malfunctions or you get an unexpected rain. 33. Remember to weed your lawn and garden regularly. Weeds compete with other plants for nutrients, light and water. 34. Wash your car and pets on the lawn, and you’ll water your lawn at the same time. 35. Use porous materials for walkways and patios to keep water in your yard and prevent wasteful runoff.